The conscious Ascension into the Light is the ultimate goal of every human being, and that, for this achievement, mastery and sublimation of all the energies that have been drawn forth by the individual, in both the past and the present, is an indispensable requirement. To accomplish this in the past, for the average individual, was so beset with difficulties that scarcely one member of the entire human race, in each year could possibly have achieved it. The year 1954 was the beginning of the Era of Freedom for the Earth! It was a time in the history of the Planet in which Freedom is to take the eternal Dominion here. This means that the energy enfolding mankind and in the atmosphere, which has been charged with impurity, discord and viciousness, will be transmuted by this Violet Fire and when this is done, man will be free again to receive directions from his God Presence and the Ascended Host of Light and start going faster to his ultimate Goal - the Ascension. Primarily, the Violet Transmuting Flame, though as a unit, may and does act independently, yet it is a part and parcel of the Cosmic Sacred Fire which is God's Pure Energy. (2) To manifest itself, should be invoked through a "Decree", from one's own Christ Self or through any Member of the Spiritual Hierarchy or Cosmic Being that has particularly dedicated Himself or Herself to this special service. Usually These Beings belong to the Seventh Ray. When it is called into action by Invocation (3) and starts manifesting itself, it accelerates the vibratory action of the electrons which make up the atoms which compose the four lower vehicles of the individual. As this acceleration takes place, the cells and atoms automatically throw off the effluvia consciously or unconsciously gathered through the ages. As they dislodge themselves, fall into the Sacred Fire, where, purified, are returned to the individual with the required specific God quality. The time required for the transmutation depends upon the amount of the effluvia, the faith with which the effort is done and the perseverance of the individual. Through their constant use and their power, the individual is enabled to magnetize more Light and thus expand his influence and his usefulness. When this is done collectively, it creates a "pull" of God Beings who, for the lack of this "pull" have not been able to serve humanity. "Even Alpha and Omega", said Saint Germain,("Bridge", July, 1955, p. 11), "Themselves - will not deny the magnetic pull of your Heart. Remember, the Sun Itself - Helios and Vesta - any Cosmic Being, any Angel, Deva or Power of Light, must respond to the magnetic pull of your Heart in Invocation. The immediate effect of Invocation, when directed to an Ascended or Cosmic Being, comes through Radiation. The Power of Radiation is the thing that does the mighty work in the decrees that go forth; it is the power of Radiation in the mental and feeling world of mankind which touches the Light within the Heart. Through that mighty vibratory action, the whole attunement of the individual is set anew and enables the perfect work to go on. This activity is an activity of the Fourth Dimension (Higher Octaves - ARC editor) and, by necessity, difficult to set it in words and more difficult to understand it, unless one has personal experience of it. "Those Who serve on the Seventh Ray - Arcturus and Victoria, Zadkiel and Holy Amethyst, Ascended Master Saint Germain and Portia, Kuan Yin and Myself, and the Ascended, Seraphic, Cherubic and Angelic Legions Who serve with Us. My Beloved Sister, Kwan Yin, and All of Us have taken a voluntary vow to Helios and Vesta that We would never enter Nirvana until the Earth and all her evolutions are completely free of distress." During the Atlantean days, the Violet Flame of Transmutation had been much magnetized and used, and there had been built magnificent Temples for Its Invocation and Radiation. But it was in Lemuria where the Flames of the Sacred Fire had reached their zenith and power and this because human deterioration had not yet started. In the following, we give excerpts of an address given by the Maha Chohan to the students at His Retreat at Ceylon.
" . . . You have heard something about the beautiful Temples of Light which have been active on this Planet in the past. Of course, there were Foci of the Flames of the Sacred Fire upon the continent of Lemuria where the Ascended Masters and the Angelic Hosts walked and talked freely with the priesthood there. This priesthood was made up of men and women who were highly spiritually evolved and who were able, through their developed powers of the Sacred Fire which was anchored within their own hearts, to magnetize from the Ascended Masters' Realm certain God Gifts for the Blessing of the entire race. This magnetized Radiation of perfection kept the Earth's atmosphere filled with the Faith of the First Ray, the Illumination of the Second, the Love of the Third, the Purity of the Fourth, the Consecration to service and the power to Concentrate of the Fifth, the Peace and the desire to Minister to Mankind of the Sixth, and the conscious realization of the Power of Invocation and Radiation of the. Seventh Ray. In the following, we present excerpts of two Discourses on the Violet Transmuting Flame, one given by Neptune and the other by Archangel Zadkiel. In both these discourses, practically every aspect of the Sacred Fire received due attention, plus other vital information cogent for a full understanding of this much-important subject.
" . . . Now, again I ask you to follow with Me the picture and pattern of the electrons as they exist within your emotional bodies. This picture will help you much in your visualization and in your use of the powers of the Sacred Fire to dislodge from around the electrons the discordant substance which you have drawn into your emotional vehicles by suction from the world without through indulgence in thoughts and feelings of an inharmonious nature. "As the individual uses the Powers of the Sacred Fire, such as the Violet Transmuting Flame, or the Flame of Cosmic Christ Purity, what takes place? The 'wedges' of dark, heavy substance around the electrons are loosened and gradually thrown off. The vibratory action of the electron increases and it vibrates more rapidly in its orbit around the central core of each atom. Then, as you consciously call to the Beings Who represent the Virtues of a Perfect Ascended Master nature, asking Them to charge into the forcefields around the electrons, those Virtues - They will do it! Thus you build into your emotional body a storehouse of constructive energy which will act in the future as automatically as the destructive vibrations have acted in the past. "Now, let us look at this from a scientific standpoint! Early in your instruction, the Beloved Saint Germain gave you a set of daily exercises which would be of tremendous assistance to you if you were to use them. Under the present pressure of daily living, this instruction seems to have receded into the background of your minds, but We present it to you here again. . . . "
" . . . The Beloved Saint Germain suggested that before retiring at night, you stand in your room and, calling the Violet Transmuting Flame into action, up, through, and around you, for at least nine feet in every direction. You raise your hands to your I AM Presence, asking It and Saint Germain to qualify those hands with the Purifying Power of the Violet Transmuting Flame. . . . "
"Now, for a lack of a 'Cosmic Screen', let us use the upper figure of the chart (the I AM Presence Portrait - ARC editor) as a visual aid. "Will you please consider this figure as a magnified electron, the beams of light pouring from it forming the forcefield of the electron. That electron may be part of any one of the four lower bodies emotional, mental, etheric or physical - each electron, of course, being composed of the natural element to which the body belongs, that is, air, earth, fire or water. "These electronic particles have, within their center, an intelligence which is a replica of your own individualized "I AM" Presence. Countless electrons form the atmosphere of the Seven Spheres - in each one of which, these electrons ensoul the color, the quality and the nature of the Chohan, the Archangel, the Elohim and the Sphere in which They abide - so on, upward from the Seventh to the First. "In each Sphere, these electrons are utilized by the Immortal Flame of God through any self-conscious being Master, Angel, or Man. When you chose individualization and your Immortal Flame descended into the Fourth Sphere where the Holy Christ Self was fashioned - elemental light (which is composed of countless of these tiny electrons) was magnetized by your own God Identity and drawn around the Flame, within your heart, by the Builders of Form. "The Ascended Master Body is made up of these beautiful, electronic particles - all in constant motion, moving so rapidly that they cannot be seen by the human sight. . . . "
"In every sphere, these electrons have cooperated with your individualized I AM Presence in the building of your various bodies. From the Electronic Body down to your physical vehicle, pure electronic light responded to the pull of the Immortal Three-fold Flame in your heart and fashioned for you each one of the various vehicles through which you find expression: viz., the Electronic Body; the Causal Body; the Holy Christ Self; the emotional body; the mental' the etheric and the physical form. Electronic Light circling around the central core of millions of atoms make up your flesh body. Now, what has happened to these perfect vehicles which were created to allow the lifestream the privilege of cooperation with God? "In the upper part of the chart (which we are using for illustration of a much-magnified electron) the substance of imperfection or effluvia has been wedged in between the light rays that pour forth from central core. This dark substance looks like pie-shaped "wedges" as it has been forced into those spaces through the centuries. These spaces should be filled only with Light Substance, so that the tiny electrons might be able to spin freely around their central core. When this dark substance is present, however, it slows down the vibrations of the electrons which make up the atoms of your inner bodies as well as your flesh body. "How is that done?" you ask. By the absorption of the discordant effluvia of the outside world through individuals attention upon and the acceptance of the discordant feelings released by the mass of the people whether those feelings be fear, depression, impurity, rebellion, hate; whatever they might be! "Into these 'wedges' is drawn the dark substance (energy qualified with too low a vibration to emit light). What effect has this on the electrons as they spin around the central core of the atoms? It bogs them down. In other words, it slows down the motion of the electrons and even as the Earth groans because of the heavy weight of man's discord which It carries as It turns on Its axis, so do the electrons in their endeavor to keep circling around the central core of each atom at their natural speed carry the weight which has been absorbed by contagion - in your feelings, your mind, your etheric body and your flesh form. . . . "
"The Sacred Fire of Purification renders the same service and makes each one of your four lower bodies lighter - Why? Because as you consciously invoke that Violet Fire and see it sweep up, in, through and around that dark, heavy substance, It instantly obeys your command and that effluvia is removed from the forcefield around each electron and transmuted into Pure Light again through the action of the Sacred Fire. "Now - those of you who are following My words with understanding should feel a tingling sensation in the extremities of your outer bodies - in your fingers and even in your toes - because while I AM speaking to you, We are dislodging tremendous concentrates of that dark, heavy substance from each one of your lower bodies. "The substance that I speak of looks something like the sooty deposits inside a chimney that has not been cleaned for a long time, and We are extracting that heavy substance, almost by hand, you might say; it is wedged in so tightly around the electrons. As it is removed, you will feel a great sense of relief and release, especially in your emotional bodies (the one with which I AM most concerned). However, I must warn you not to draw that substance back into your various bodies again through the affinity you have for it in your feelings, having lived with it so long. . . ."
"The feeling bodies of mankind are active twenty-four hours of the day - and being literally catapulted into the atmosphere form blankets of misqualified energy which is looking for a home and for some life to sustain it. It is a vampire activity because it can live only on the thought and feeling vibrations of some lifestream who is willing to give it a home and entertain it. . . ."
"Your feeling body was provided for you for one purpose alone: to radiate, magnify, and expand some particular virtue of the God-head, and for no other reason. . . . "
On the following, we give excerpts of an address given to the students by Archangel Zadkiel, on the Sacred Fire, September 28, 1957. 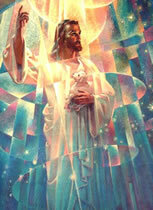 It was presented at the Retreat of Archangel Michael, at Banff, in the Canadian Rockies. ". . . Now, as We have told you, all the activities of the Violet Fire are not identical in every Sphere. This has aroused a little curiosity in the minds of the 'research' members of Our Activity, so I shall endeavor to explain. "In any Realm where no imperfection exists, the Violet Fire is utilized by Cosmic Beings, Ascended Masters and the Angelic Host, to etherealize a form which has served its purpose for being. For instance, let us take the First Sphere which is the natural habitat of the Archangel Michael, Beloved Morya and Hercules - into which ideas of the Godhead first flow. The Beings of the Blue Ray are in constant busy service there, endeavoring to utilize those ideas for the ever-expanding blessings of God to man. "Each of these ideas has a heart-centre, which represents the magnetic power of the Immortal Three-fold Flame of Eternal Truth which abides within your physical heart and renders that service of cohesion to you. "Later, around those ideas the Beings of the Second Ray coalesce the form thereof. These ideas are tremendous in their scope and there is no human mind which can describe them. However, if the Great Beings in the First sphere, by looking at the Cosmic Screen (not only for this Planet Earth, but for all this entire Solar System), see that those particular ideas cannot be efficaciously used at that time, what do They do? These great Beings then invoke and project the Violet Ray into that idea and, by the activity of Etherealization, They release the substance within and around that form, letting it return to the Universal from whence it came, to be used again in the future for some other purpose and form. The conservation of energy in Heaven's Realm is most magnificent indeed! Even in the Realms of Light - no Perfected Being would ever hold in form any substance--after it has served its purpose and has completed its course of manifestation. "Etherealization through the conscious use of the Violet Fire is well known on all the Planets of this System and was used here on Earth by your own dear selves before you forgot the way back "Home". At the completion of a designated life-span, Etherealization is the way and means by which the people of Venus, through conscious endeavor, transmute into light (leaving no residue behind) the physical vehicles in which lifestreams have functioned. Conscious Etherealization can be used by any man, woman or child on this Planet Earth who will consciously, lovingly and gratefully call forth the Violet Flame, because Etherealization is one of the gifts of that beneficent Friend to life. . . .
"The Source of every Ray, Flame or Virtue is the Heart of God! The Ray strikes downward to the point where the call has gone up - where the magnetic pull of energy consciously invoked It; then beginning the return to Its Source that Ray becomes a Flame which rises upward because as has been said so often, it is the nature of the Flame always to ascend! Inasmuch as Light is Life - God's Own Life - the substance of the Ray and Flame which have come forth as the result of someone's conscious Invocation - that Light is the very Life-essence animating any Project or Activity. That is why so many good 'Movements' of a spiritual as well as of a secular nature cease to have life when the magnetizing lifestream in physical form takes his or her departure to Inner Levels in so-called 'death'. As a rule, the followers of the doctrine which that one has magnetized do not understand that the Flame must be rhythmically called forth and nourished by daily application. Otherwise, the Flame will ascend right back to the Father from Whom It came and the sustaining power of the Activity, therefore, ceases to be in this octave. "Now to sustain the Violet Flame in this physical appearance world, there must be self-conscious lifestreams to act as magnets for this Flame, with willing minds and hearts and an understanding of the efficacy of this application. These lifestreams should continue joyously to draw the Flame and rhythmically bathe the physical, etheric, mental and emotional vehicles of themselves and the entire race in that Violet Fire. Thus they sustain Its action here in Earth's atmosphere. "In these days when the activities of the Seventh Ray are so much in evidence and the reign of our Beloved Saint Germain as Chohan of the Seventh Ray has already begun, you have great opportunity to call forth this Violet Fire into this physical world around persons, places, conditions and things where it is most surely needed! To have the most efficacious use of this purifying activity of the Violet Fire, I am going to try to bring to you today a realization of the importance of Rhythm in your use of it. It is better to use the Flame for shorter periods at a time and not to stay at it too long. It is much better to call it forth more often, for shorter periods at a time, in a rhythmic activity as we have suggested to you time after time. Set aside some uninterrupted time each day - if only five full minutes at a time (say three times a day - morning, noon and night) to invoke that Violet Flame - calling for It to blaze up, in, through and around you; at that time giving conscious recognition to the Great Beings Who serve it and Who have sustained It all through the ages by the gift of Their Own life. Feel Its activity in, through, and around you then expanding out into the world about you which requires it so much. If you will do this, not tiring of the exercise or considering it a chore, but with a consciousness of joyous gratitude for the use of this merciful transmuting power which is yours as a glad, free Gift of Love from "your Heavenly Father" (your own Individualized "I AM" Presence) there is no reason why this Violet Flame cannot be externalized in this physical appearance world visible and tangible to the physical sight of all that sees. "On Atlantis, long ago, we did externalize a gigantic focus of this Violet Fire and Its radiating Flame was seen by the physical sight of all for a distance of a thousand miles in all directions! . . . But it had to be consciously called forth once every hour, during each twenty-four hour period. . . . "
"The use of the Violet Ray and Flame is so practical - but in its Invocation never allow feeling of fear, doubt and discouragement to remain in your world and to register within your etheric bodies. The moment you become tense in your application or the moment you sense within yourself a feeling of strain in applying the Law, that moment your feeling world has questioned the absolute science of the magnetization and Radiation of this Flame. If this occurs just let your application alone for a while - turn your attention to something else. Later, when you have quieted your feelings again, call upon your Ascended Master Friend of Light (whichever One or more of Us you desire) and ask that One to give you His feeling of the exact science and absolutely unfailing Law which is within the magnetizing and radiating of this Virtue of Freedom! Believe Me - you will receive that for which you ask! Be still for a moment, however, and wait for the Master's feelings to flood your emotional body. You see, it is the trying too hard - the striving - through over-consciousness, which delays so much of your manifestation. . . . "
"At Inner Levels of consciousness, below the Perfected Realms, just what does the Violet Fire do - and what is the service of Its Ministering Angels? As you have been told, there are limitless Legions of Angels of Mercy and Compassion (qualities of Violet Fire) Who give as much service as They can in the Astral Realm. This is the Realm which constitutes most of the Earth's atmosphere - in the past and up to this time, for that Realm extends out from the Earth about ten thousand feet. In this Realm abide the destructively qualified thought and feeling forms, created and released by mankind during embodiment here and, until a year or so ago (1956) souls who had passed from physical embodiment but, because of certain magnetic attraction to the discord of Earth through habits of thought, feeling, spoken word and deed of a like nature, were often bound in this Realm for long periods of time. This condition, as you know, has now been remedied and no soul is allowed to remain in Earth's atmosphere after leaving the body. They are taken directly through to Inner Levels where they are assisted in gaining their freedom more quickly. This is one of the tremendous mercies of the Cosmic Law which has been recently made possible, during the last few years in particular, by the calls from unascended mankind for the use of the Violet Transmuting Flame and other Activities of the Sacred Fire. "Today there are no discarnate souls allowed to remain in the atmosphere of Earth. Now, as a soul leaves its garment of flesh, in what the world terms 'death', that one is met by certain Angels who render that service. These souls are then taken (I am speaking of the masses of mankind now, who know nothing of the use of the Violet Fire as you do) to the River of the Violet Flame (spoken of in mythology as "The River Styx"). This "river" had been provided at Inner Levels for the purification of those lifestreams from as much discordantly qualified energy as possible, before either going to the 'Sleepers' Realm' (if they need that rest) or before appearing before the Karmic Board to receive their assignments of study and service at Inner Levels between embodiments. . . . "
"This River of Violet Fire of which we spoke, has been drawn forth by Those Who serve the Seventh Ray according to the same principles which We described to you earlier in this Address - the drawing first of the Ray through Invocation to the Godhead in the Name and Authority of the Creative Word 'I AM', then as the Ray reaches the destination into which It was called forth, It immediately turn upward in the living Flame activity, as It returns to Its Source, completing the circle of Its existence. As this Invocation is rhythmically continued day after day, year after year, and century after century (in the case of the Angels Who have drawn this River of Violet Fire), this Ray and Flame become very, very powerful and expand in size until they become a veritable 'river' of this merciful, purifying, freeing Essence, into which the evolutions of Earth may be taken between embodiments for as much purification as possible. This "river" has been sustained by the constant, never-ending, rhythmic calls of these Angels at definite periods during the twenty-four hours. "The beauty of this Violet Fire River is indescribable; therefore, its appearance does not frighten these souls who have passed through the change called 'death' when they are invited to step into It and bathe in Its substance. This Violet Fire then dissolves much of the causes and cores of the physical distresses of the individual's past Earth-life, especially those which caused their demise. "Legions of Violet Fire Angels surround the Halls of Karma as the soul who has just been released from an Earth life is called to appear before the Karmic Board. These Angels provide an atmosphere of purifying Violet Fire there so that every soul who, as he appears before the Karmic Board, must pass through Their Radiation as They enter these Halls. Then, when the souls are given their individual assignments for instruction and assistance between embodiments, some of these Violet Fire Angels go with them to their places of abode at Inner Levels. 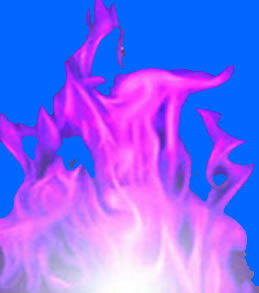 While in these Inner Spheres, the Violet Fire Angels often use a very delicate shade of violet so that, as easily as possible, They are able to minister to these individuals without arousing the rebellions and resentments of their inner bodies by too quick or powerful and activity - even of the Mercy Flame! 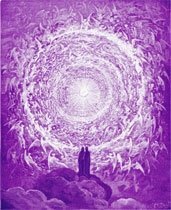 "Again, before entering the Gates of Birth, when the soul who desires to re-embody stands before the Karmic Board to ask permission to do so, these lovely Angels of Violet Fire stand around the Karmic Halls - circle after circle - tier upon tier - as far as the eye can see! The love and beauty of these Violet Fire Angels is simply beyond description! Here again They provide an atmosphere of Mercy and Purification to assist the soul who needs Their help. "Especially since the advent of the Seventh Ray to this Planet, whenever and wherever possible, the Angels of Mercy and Compassion go with an incoming soul, going into places, sometimes, which are not too pure. They endeavor to prepare the home and its atmosphere (as well as the parents - as much as they can) for the coming of the infant. At times, such an Angel is permitted to remain with that infant for a while - at least until the time comes when the little mind is disabused (shall we say) of the reality of the Angels. When this 'shell' of rejection in thought and feeling is thus set up around the child, this beautiful Angel must leave that one and return to the Inner Spheres again! "Angels of Mercy and Compassion are always serving as much as possible in hospitals, mental institutions, and foci of mankind's need and discord. Today, some of these are actually living in aura of the conscious chelas (those of you who are daily consciously calling forth the Violet Fire - at least six of these glorious Beings stand around every conscious chela who daily calls forth the Violet Fire for purification). Such Angels await your daily conscious recognition and calls for Their greater assistance to your use of this merciful Flame of Freedom. . . . "
In the following, we receive additional information on this most important subject of the Violet Flame, from The Maha Chohan. 2. The Flame is the Vibration of the Godhead and the cohesive power that holds the Sun and Stars in space and which - through the Light Rays from the Sun - fills the atmosphere of the Earth. "I cannot urge you deeply or too earnestly to experiment with the Invocation and direction of Flame, visualizing and feeling It an intelligent, capable, independent Element and allowing that Element as much Freedom as you allow the physical flame when you apply it for cooking or disposing of unwanted substance.". In the following, we get another view of the "use" of the Sacred Fire - Violet Flame - and what a group of students wanted to do with it. In 1954, a group of earnest and ardent students, invoked the Karmic Board to be permitted to help, through the use of the Violet Flame, the souls of men, that have passed to the other side, so that they will not have to re-embody on Earth. These Invocations were so numerous and so persistent that the Karmic Board, realizing that these students didn't fully realize the responsibilities they would have assumed, should their request was granted, They asked Chohan Serapis Bey to give them the necessary information. In the following, we give excerpts of Serapis' address.
" . . . I was told by the Karmic Board that you are storming the very gates of Heaven in a magnificent desire to assist mankind (once they are released from embodiment) from the necessity of taking again an Earth body - giving them the tremendous freedom to complete their evolution at the Inner Level. It is desired by the Karmic Board that you might understand something of the intricacies of the act of Mercy which you called forth, in order that you may intelligently - in your application - prepare for the granting of such a great petition and the blessing of freeing these souls from the necessity of reembodiment. It is one thing to ask innocently for the release of mankind from re-embodiment and it is quite another to know the pressure that you will place upon the Beings at Inner Levels, Who must care for, guide, train, educate and redeem these ever-increasing millions and millions of lifestreams. "Individuals that perform acts of emotional cruelty charge the substance of the emotional and feeling planes (the great mass, I mean) with certain vibratory' actions which will record primarily in the emotional body of that same lifestream in a later era. These various types of crimes, whether they are physical, mental or emotional - in their return circuit - are primarily the causes for the diseases of mind, feeling and flesh. Now, in order for a soul to receive its full freedom from any theatre of evolution, it must of necessity redeem the energies it has qualified imperfectly. For that reason, it is required of that soul that it have a body in each of these planes including a physical form through which it may redeem the physical elemental life. That was the Occult Law of the past, as you know. This was the reason why the Cosmic Law did not allow individuals to finish their progress at Inner Levels until they perfected and redeemed their physical energies on the physical plane. "When the activity of the Sacred Fire came forth and the great group work under the Ascended Master Saint Germain began, there were what you might call 'Cosmic Incinerators', established which, at Inner Levels, took into themselves the unpaid debts of the physical energy that had been imperfectly qualified by certain lifestreams. These individuals who had rendered great service in other eras, even though they had yet some unconsumed karma, were not required to return to Earth. They were the first individuals to enjoy the New Dispensation and were allowed to go to Venus and to other Stars and Systems to complete their evolution. In the mass Decrees invoking the use of the Violet Fire of Freedom's Love, the student body consumed for these few individuals (who were among those who received that Dispensation) the necessity of returning again in an Earth body to complete their personal redemption. Archangel Michael speaking to a class of students some time ago, and referring to the power and efficacy of the Violet Transmuting Flame, said that mankind cannot be free without its beneficent use, and the only one who could bring it forth was Saint Germain because it belongs to His Ray (the Seventh) and Authority. Neither Jesus nor I, he continued, could bring it forth because it does not belong to our element and sphere of influence. "The Godhead always appears clothed in Robes of Flame. The Sacred Fire is the whole activity of God. Flame is the highest manifestation of visible, tangible Substance. Light is an emanation of the Flame - the Cosmic Effect and The Fire of Creation is the Cosmic Cause. There is a nameless, unseen, indescribable Force within The Sacred Fire which is its Heart-Center, but for man, the highest that his consciousness can comprehend as the manifestation of God is the Sacred Fire. The Fire Element is the Supreme governing authority in the forces of the elements, the life of man, and the Solar System. The Fire of Creation is the individual, Eternal Identity of every human being. It is dual in its purpose for It constantly creates manifestation of itself, and may be called on to transmute imperfect expressions created by man. This two-fold action of the Sacred Fire is the Gift of God to His Creation. The most ancient of Spiritual Customs of the peoples of this Planet, and other Planets, was the worship of The Fire Element. The Flame within the heart is one of the manifold expressions of this Fire of God. In the physical world, the elements of water, air and earth are provided for man without self-conscious effort on his part and given to him as gifts for his use, but to enjoy the Fourth Element (which is by Its name an Element of the Fourth Dimension) one must exert conscious effort and through certain processes draw forth this Sacred Fire. This is true, not only in ordinary physical activity but also in Spiritual activity. Many, many centuries ago, Blessed Zarathustra brought the physical knowledge of the Fire Element to the outer minds of man that he may use it for heat, light, and in Its transmuting activity, to remove debris, and He, since Fire is His natural Element, is most active in kindling the Spiritual Fire in the hearts and minds of upward reaching man today." Blaze the Victorious Violet Fire of Freedom's Love through all destructive karma, bearing my stamp in the Universe, before it presents itself on me for redemption. Close it on it all and transmute! transmute! transmute all cause, effect, record and memory, before it can act, approach or longer be sustained. Replace it by the Ascended Masters Self-Luminous Intelligent Substance of Light, eternally sustained and ever expanding to the complete fulfillment of God's Great Divine Plan. "Invocation, to become Sacred Fire, must cross with Ministration, the carrying of that Power invoked into the world of form. Invocation must cross with Illumination, carrying the received thoughts into the world of form. Invocation must cross with the activity of Consecration that the Energies drawn from the Heart of God may be consecrated to Service. . . . "
" . . . In your efforts to expand your consciousness, you will find the Sacred Fire is a tangible substance that can be wielded and molded as can any material of the physical plane. "The Higher Consciousness cannot be achieved when you identify yourself with the physical form. The Flame, in Its Great Power, can be wielded best from the Higher Radiation of your Holy Christ Self. The physical consciousness, being so impregnated with the idea of form, finds it is out of its element in dealing with the Flame of God and cannot even control physical form with much success. Therefore, to treat the physical body and inner bodies by the drawing, focusing and expanding of the Sacred Fire from above, or from within your hearts will bring much greater results than by trying to expand it through the instruments in question from below. This, I think, will assist you in the powerful freeing of your vehicles from the impure substance of the third dimensional plane. "When the outer self and the "I AM" Presence are going to affect a movement for the expression of the God within, they must first of all become in harmony this is achieved in Silence, in Love, in Peace. It is done by the absolute transmutation of every critical and inharmonious thought and feeling. . . . "
"The first Chohan of the Seventh Ray was the Beloved Archangel Zadkiel. He was followed in successive order by Sanat Kumara, the Lord Gautama Buddha, the Goddess of Mercy, Kwan Yin, and now Saint Germain. Initiates are now in training and preparing for the opportunity of assuming this Office when Saint Germain is called to greater Service in the near future." Tellis Papastavro was born in Greece and spent his formative years in the radiance of Beloved Pallas Athena's Temple of Truth. When he was 17 years old, he came to America where he spent his life seeking the answers to the questions "Who am I? Where did I come from?" Tellis found his answers in the information and teachings that were being released to Humanity, in an accelerated fashion, in accordance with Cosmic Edict. This information and teachings came from several key sources and was preparing Humanity to work in cooperation with the Ascended Host for the purpose of transforming the Planet into Her Divine Heritage, which is Heaven on Earth. Realizing the necessity of a publication that would make these teachings available to every seeker - neophyte and experienced alike - Tellis compiled this information into "a handy manual of ordered teachings" and ""The Gnosis and the Law" was created. The material is considered the "Jewel Teachings" of the Spiritual Hierarchy. Tellis was a selfless servant of the Light, and his sole purpose in publishing this sacred book of illumined Truth was to expand the wisdom and knowledge of God on Earth. Our Beloved Tellis returned to Greece in 1988 where he made his final preparation to leave the Earth. He was called home on February 3, 1989 at the age of ninety nine.